Come and join the wonderful Pantaloons, as they perform their theatre adaptation of Jane Austin�s book, Sense and Sensibility, which will no doubt include their own inimitable brand of buffoonery. This will be an open air theatre show in the lovely surroundings of the Deepdale Orchard, unless the weather is awful in which case it will be held indoors in the Brick Barn. Although checkout is using the Paypal system, you don�t need a Paypal account. When you have selected your tickets and clicked on Checkout with Paypal, just click on the link below Login which says Pay with Debit or Credit Card. Paper tickets will also be available in due course for the event from Deepdale Visitor Information Centre. Sorry those tickets can�t be posted out, just picked up in person. 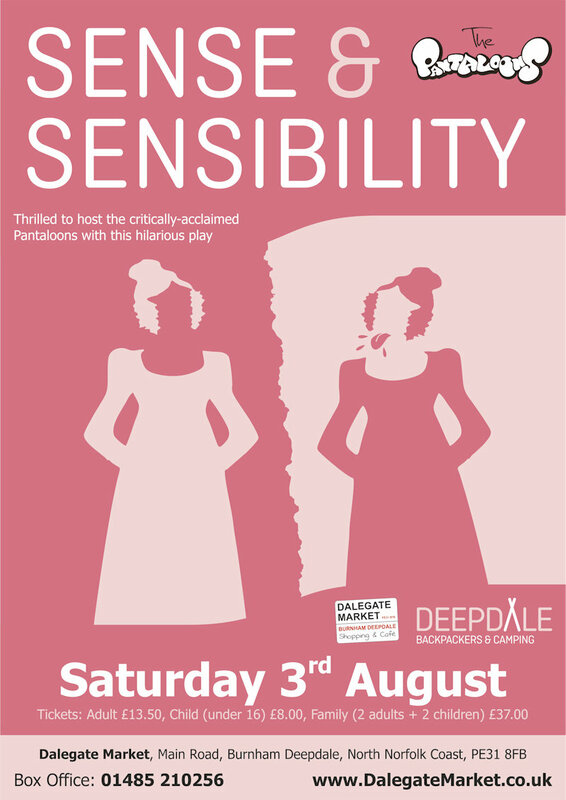 Sense & Sensibility - Open Air Theatre at Dalegate Market - We are thrilled to welcome back the critically-acclaimed Pantaloons for their newest outdoor theatre play. More details to follow, but we do know it will be an innovative and hilarious open-air show.